My family has had the blessed opportunity to study science with the help of various Apologia Educational Ministries elementary science curriculum over the years. My two older boys discovered the wonders of God’s creation while they (at least in their minds) zoomed through space, dug in the dirt and observed plant life, swam the seas, and so much more. The Exploring Creation series has a reputation for being rich, full, and deep with learning. My daughter has now come to an age where she is ready to begin her own journey through creation. We couldn’t have times things more perfectly since our beloved Astronomy curriculum was just revamped. For several weeks now my six year old has been soaring through space with Exploring Creation with Astronomy, 2nd Edition from Apologia Educational Ministries. From the moment the box of goodies arrived I was taken. The new books are so colorful and full of life. Everything about them has been updated with our young learners in mind. But I might be getting ahead of myself here. Let me tell you all about it, step by step. The Exploring Creation series of science curriculum from Apologia Educational Ministries is a must have, in my opinion, for every Christian homeschool. This series is geared toward the elementary student and it engrosses children deep into the science of God’s creation. This latest edition of Exploring Creation with Astronomy takes an already fantastic curriculum up a notch. It has been expanded with even more beautiful photographs, illustrations, infographics, a wonderful layout, and a fantastic schedule. Audio CDThey also recently released the Astronomy 2nd Edition Science Kit. I’m interested in checkout this out but I did not have it for this review. All of the Apologia Science curriculums, including this Astronomy series, use a combination of reading aloud with a student notebooking journal. As a six year old I had my daughter use the Jr. Notebooking Journal which includes lapbook like projects such as minibooks, word search puzzles, scripture copywork, and other hands-on activities. One of the beautiful things about this curriculum is that you can combine children of many ages into one study since older elementary children can use the Notebooking Journal meant for their age. It is a delight in our home to study together whenever possible. The Audio CD is a beautiful edition to this program. It is a clear and enjoyable reading of the text aloud. We do a tremendous amount of reading aloud in our family and it is something I treasure. However, the opportunity to let someone else take that over from time to time is a blessing for this poor momma and my tired voice. It can also help children be more independent with their studying since they can listen and read along in the book at the same time. The brand new Astronomy 2nd Edition Science Kit looks really exciting with a wide variety of activities to take your family’s study of Astronomy even further. My daughter Joyanna who is six was just so excited to be given the opportunity to review this curriculum. She’s aware that her brothers have used other science studies from Apologia before and this made her feel like such a big girl. I decided right off the bat that we’d be using the Mp3 Audiobook most days. As I said, we already read aloud in this family for hours every day, I am grateful for break. However I did sit right along side her so I could listen to every word with her. This program is certainly open and go. There is a brand new Daily Lesson schedule near the beginning of the Notebooking Journals complete with little check boxes for you to check off as you complete an activity. I’m enjoying this schedule. It’s pretty easy going. I remember the schedule in the previous edition was a bit intense and I found myself breaking up the reading and assignments into smaller chunks over more days. This schedule is more relaxed and easier for my family to keep up with. At first I was a bit confused by this schedule because it does include all of the activities in the new science kit. I didn’t realize the directions for those activities are mostly in the kit. I assumed the kit was just the supplies for those activities. I was hunting around trying to figure out how to do these activities and the information isn’t there. HOWEVER, there are directions for plenty of other activities and we found the curriculum to be plenty rich without the extra kit. There are links and information for downloading all kinds of interesting activities to expand your studies. In fact, as a busy mom of four I’m not 100% sure I want to do all of the extra activitieswith the activity kit. This curriculum is incredibly in dept on its own. So no pressure to buy that kit. I simply didn’t understand how it all worked at first. We work on this curriculum just about 3 days per week. We listen to the audio CD and then complete the assignment notebook activities. I often pause the audio just to put emphasis on some point or thought or to ask my own question. Sometimes I just like to bring awe and wonder to what we just heard. “Can you believe God thought to….! !” My daughter so enjoys this time in her science curriculum. The Jr. Notebooking Journal is a good fit for her in general. It is meant for children who are early writers. There isn’t a tremendous amount of writing involved but this is still an emerging skill for her. So I help her. I will sometimes fill in the blanks with her answers or maybe write a bit down on another piece of paper for her to copy. In this instance my goal isn’t to develop her writing but for her to learn science. So we learn science and I make it easy. The Notebooking Journal for the older elementary student is designed to make the children think more about what they’ve learned. The responses are longer and children draw conclusions about their reading. There are fewer puzzles and minibooks and more longish answer type activities. If my 10 year old wasn’t already deep into Exploring Creation with Human Anatomy it’d be perfect for him. Exploring Creation with Astronomy, 2nd Edition from Apologia Educational Ministries is fantastic! The science is so rich. The biblical world view is refreshing. The text is engaging. The notebooking activities are fun. The learning is fantastic. If you are looking for a rich science curriculum, one that dives deep and immerses your children in learning and God’s worldview than you really can’t go wrong with this study. Each has a list price of $14.95. Each is priced at $8.97. Each has a list price of Price: $8.97 each (or $59.82 for the entire series). Library and Educational Services is actually a wholesale company of so many different educational products that it’ll make your head spin to flip through their website. The Go Science DVDs are hosted by Ben Roy, a science teacher at the University of Tennessee at Chattanooga. His enthusiastic personality is quite contagious. You can’t help but be drawn into each of his experiments and learning concepts as he moves you through his video lessons. 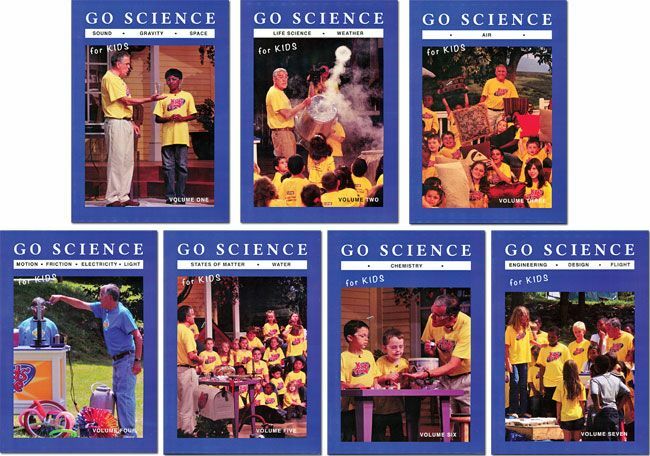 What makes the Go Science DVD’s truly special is how Mr. Roy ties God’s creation into every single video lesson. He ends each and every video with “When we learn more about science, we learn more about our Creator, God.” I just love that! You can never be reminded too often of how God is the center and creator of everything. Mr. Roy ties a character lesson into every episode too. The videos are generally set in a backyard or even porch type setting. It sort of felt like Mr. Roy was leading a group of kids in a fun outdoor lesson during summer camp or vacation Bible school ! The children in the videos seem to range in age from younger elementary to older middle school or so. Mixed ages, much like you’d see in a larger homeschool gathering. I really appreciated how occasionally the experiments didn’t work quite right the very first time they tried. It was nice that these instances weren’t edited out. That is real life isn’t it? Also, while some of these experiments can be done at home, it was actually nice that my children had exposure to lessons that we just can’t do or aren’t likely to do. Liquid nitrogen just isn’t something I have easily accessible. Originally I assumed my children would want to watch just a couple of episodes in a video at a time. However, they got so drawn in that I ended up letting them watch nearly all of the episodes at once. Eventually they ended up watching each of the DVDs a couple of a times. Each DVD takes just about an hour to watch from beginning to end. 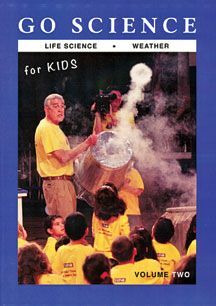 Volume 2: Life Science, Weather includes 12 experiments – 7 life science experiments and 5 weather experiments. You can watch each of the experiment episodes individually or you have the option to play the entire DVD through without stopping. 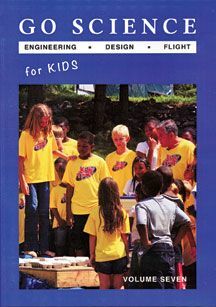 Volume 7: Engineering, Design, Flight includes 11 experiments – 7 life Engineering/Design experiments and 4 Flight experiments. As with the other DVD you can watch each of the experiment episodes individually or you have the option to play the entire DVD through without stopping. Overall we enjoyed these videos and I do think they’ll be watched again. I’m keeping these in mind for supplementing our science studies in the future.